In Search of Tranquility: Andrew Snavely treks the globe to source the leaves, buds, and flowers steeped at Dobr&aacute; Tea in Asheville, each time returning with a greater knowledge of this ancient beverage and its cultural ties. “The model of a tearoom is shelter and safety; something between a church and a pub,” says Andrew Snavely, as he sips from a cup of fragrant oolong. Sitting in a room at Dobrá Tea punctuated with colorful glass lanterns and arched niches reminiscent of North Africa, the young tea purveyor surveys the busy space he opened on Asheville’s Lexington Avenue just more than a year ago. From this vantage point, he has a perfect view of the kitchen, where staff never stop their rhythm of boiling water, measuring out loose leaf teas, and steeping them in ceramic, glass, and metal pots, to serve a half-hour or so of tranquility. In this exotic sanctuary, the low murmur of patrons’ conversations melds into a yogic mantra. Time slows, and the thought of sitting cross-legged on a kilim-strewn bench and sipping a strong Turkish black or Chinese green seems an enchanting way to spend an afternoon. After all, three o’clock is universal tea time. Almost every society enjoys a form of the hot beverage that comes from Camellia sinensis—the evergreen shrub that produces the leaves, flowers, and buds used for all teas. The variety depends on where the tea is grown and how it’s gathered and processed. At Dobrá, there are more than 100 loose-leaf varieties. The classifications are further broken down into long or short leaves, early buds or later pickings, whether the leaves are whole, broken, or rolled, and whether they’re allowed to oxidize, which darkens the tea. At 29, the South Carolina native, who was bred on sweet tea, has seen much of the world by following his passion for the beverage—first to Taiwan, then China, India, Japan, and Laos. At each stop he’s met with farmers to learn about harvesting methods and traditions. His journey originated in the less exotic locale of Portland, Oregon. There, Snavely worked in a health food store supervising the import of teas and herbs, and often frequented Asian teahouses. He moved back to his college town of Burlington, Vermont, for the chance to manage the first Dobrá tearoom in the United States, now one of a collection of shops bearing the name. It was for the cafe that he began his trips abroad, first traveling to Taiwan to research oolong. After six years running and then owning the tearoom, he decided to make a move and realized Asheville was ripe for a similar experience. Just months before opening the teahouse here, Snavely set out for Suzhou, China, to harvest Bi Luo Chun green tea leaves with a family of farmers. At the top of a mountain above Lake Taihu, he and three traveling companions strapped baskets to their waists and began collecting the tips of the spring leaves. “We walked down the mountain with our abundance of fresh plucked tips of green and carried our baskets to a ceramic wok,” recalls Snavely. “Underneath was a wood fire, and we began to toss and fry our fresh harvest.” The heat stopped the oxidation process, leaving the green leaves curled, and allowing the tea aficionado to carry his bounty home to share with tea drinkers in North Carolina. Snavely admits some journeys haven’t been as awe-inspiring as the mountain-top trek, but educational nonetheless. His reward on this trip was witnessing a harvest in the mountains of the Phongsali province, where wild trees still produce buds and leaves after 800 years. His travels have imparted lessons in cultural preferences, too. In India, he was surprised to find that the majority of people prefer masala chai—a milky, sweet, and spicy black tea mix—rather than the delicate Darjeeling, a light, floral black tea, which is more difficult to find because it’s largely given to export. All that he sources eventually finds a place in what looks like an oversized card catalog behind the counter at Dobrá. The drawers hold not only teas, but stories of history and origin waiting to fill a cup. Snavely and Dobrá’s patrons aren’t the only people taken by tea these days. North Americans are being introduced to new brews in growing numbers, abandoning mainstream tea bags, which Snavely maintains are filled with leaf dust and of inferior quality. “Remember what coffee was like before Starbucks arrived on the scene?” asks Brian Murphy, president of the online tea purveyor Tea Zaanti. The company played a role in elevating flavor expectations. It wasn’t that long ago when only a few brands of canned coffee could be found in grocery aisles. The tea offerings used to be just as bland. “The choices in tea today are amazing, and they’re still growing,” says Murphy, who two years ago joined a college friend in direct-sourcing teas from her native Thailand. Murphy’s company has seen a 30 percent growth in online sales, and wholesale purchases have increased by 50 percent. Tea is influencing the culinary world as well, think green-tea cocktails, flower-tea granita, green-tea ice cream, and Earl Grey brûlée. Those willing to explore new flavors are also opening themselves to potential health rewards. Medical research continues to tout tea’s benefits, including the effects of polyphenols and flavonoids that act as antioxidants, protecting cells against free radicals that contribute to tissue damage. The Mayo Clinic newsletter Women’s HealthSource consistently publishes studies that have found benefits in drinking tea (primarily green), including lowering cholesterol levels, blood pressure, and atherosclerosis; alleviating inflammation related to arthritis; and slowing cartilage breakdown. And although studies are limited, older adults in Japan who drank green tea daily showed less risk of memory difficulty, compared with those who didn’t imbibe regularly. While Snavely leaves the medicinal claims to science, he does encourage the relaxation and ritualistic elements of tea that can be found in his favorite tradition. “The Japanese tea ceremony is very pristine, sharp, clean, and aesthetically pleasing,” he explains. 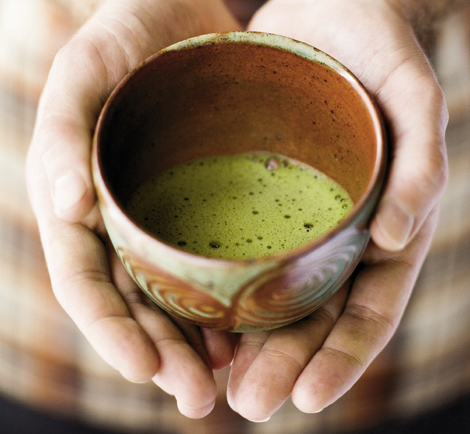 The green tea, matcha, is ground into a fine powder in a small ceramic bowl called a chawan. Then, it’s deftly mixed with hot water using a bamboo chasen, or whisk. The ritual continues with a pouring of the tea just so, and holding the cup just so—right hand holding rim of the porcelain tea bowl, left hand lightly supporting the bottom. It’s a journey he’s happy share. Just step inside his tearoom, find a cozy corner, and he’ll show you the way. China: Here, green and black teas are prominent. Small clay yixing (pronounced ee-shing) teapots are filled with copious amounts of leaves, allowing for several infusions. of making masala chai, which means mixed-spice tea, is to boil the leaves in milk, adding spices such as cardamom, pepper, ginger, and cinnamon. Egypt/Morocco: Green or black tea, strong and sweet, is served without milk. In Morocco, green tea is often poured over fresh mint leaves. The brew is typically poured from a long-spouted pot high above a glass, creating a slight froth. Japan: Green tea is favored here. Matcha is a finely ground, green tea powder whisked into a froth and used in the Japanese tea ceremony. Russia: Russians prefer green and black teas with sugar or a spoonful of jam and no milk. They often serve tea in glasses, not bowls or mugs. Turkey: Black tea is prepared into a strong extract, with boiling water added to taste. It’s served in small tea glasses with sugar. Mongolia/ Tibet: A compressed brick of tea is crushed and brewed with water and yak or goat milk. The resulting liquid is strained and mixed with salt and yak butter, and is usually drunk from a small bowl. Flavor: Chinese greens are typically sweet and nutty. Japanese greens are grassy and oceanic in taste. These leaves are picked, then heated in a wok (China) or steamed (Japan) to prevent the oxidation process from beginning. Afterward, the leaves are rolled tightly and dried again. Flavor: Floral and sweet, this tea is milkier that most greens, but not as strong as black tea. The leaves are picked and dried for a day. To bruise the edges and allow for partial oxidation, they are tossed into a bin or basket. Afterward, they’re steamed to prevent further oxidation and rolled for a final drying. Flavor: Sweet, earthy, and smooth on the palate. The buds of the bush are picked before they have completely opened, and are quickly dried without oxidation. Flavor: Stronger than white, green, and oolong with more caffeine. The leaves are dried for as long as a day, allowing oxidation to occur. They are then rolled and cracked.